Vancouver, Canada – Mawson Resources Limited (“Mawson”) or (the “Company”) (TSX:MAW) (Frankfurt:MXR) (PINKSHEETS: MWSNF) announces an update on summer geophysical programs and drilling plans at the Company’s 100% owned Rajapalot gold-cobalt project in northern Finland. The geophysical character of the gold-cobalt mineralization at Rajapalot is now well understood. Ground magnetic surveys at 25 metre line spacing are effective at locating pyrrhotite with a strong reverse remanent magnetic signal. Gradient array IP surveys can accurately locate both disseminated sulphide minerals (where the surface area of sulphides may produce a chargeable electrical response) and electrically conductive features. 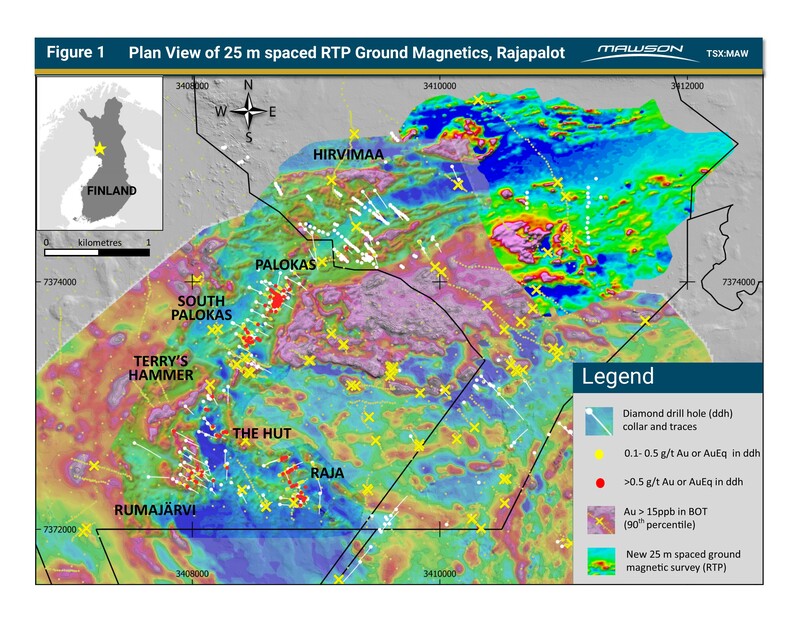 Mawson’s experience at Rajapalot indicates that gold mineralized rocks often contain sufficient sulphide minerals to form magnetic, chargeable and conductive responses. The discovery success when drill testing these features (see Figure 1) strongly supports applying this strategy in the development of new target areas. Detailed structural logging of the drill core continues in association with PGN Geoscience (Jackson van den Hove, Laurent Ailleres), in addition to regional structural and geochemical studies with Nick Oliver of HCOV Global and structural consultant Leigh Rankin. Using the skills of Mawson’s experienced personnel, these data are being integrated with field and lithogeochemical interpretations to produce a new 3D geological model to understand the shape, size, grade distribution and controls on the gold-cobalt mineralization. The ground magnetic survey was conducted by personnel from GeoVista AB (based in Luleå, Sweden). Line orientations for this program were matched with prior survey parameters. Post-collection processing and inversions of the data are completed by Dr Hans Thunehed of GeoVista AB.